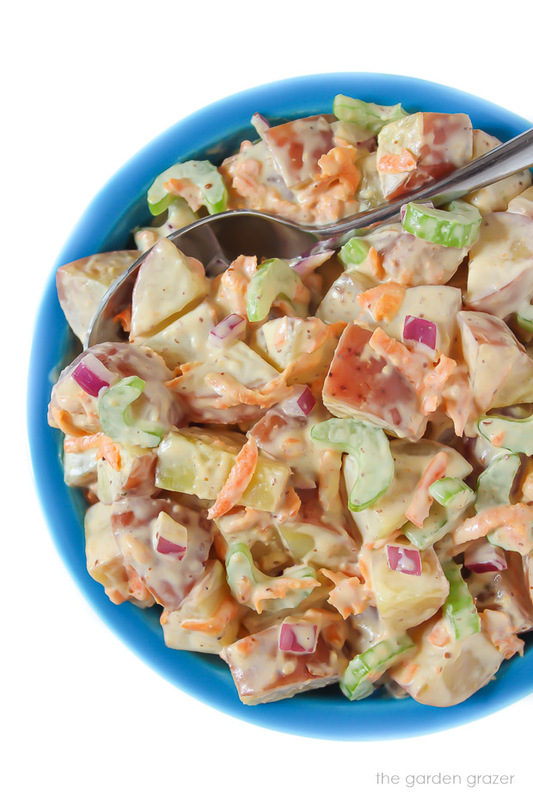 Classic Potato Salad gone vegan! This delicious summertime staple is packed with a flavorful, creamy base and refreshing crunchy veggies. Easy, 25 minutes, and only 8 ingredients! PS – I’d love to see if you make this! 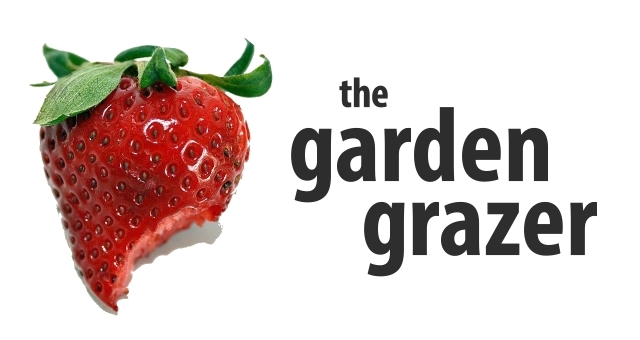 Come join The Garden Grazer on Instagram 🍓 and share your pic! Other additions: fresh herbs, parsley & dill are wonderful, chives, chopped pickles or pickle relish, capers, lemon juice, smoked paprika, bell pepper, etc. 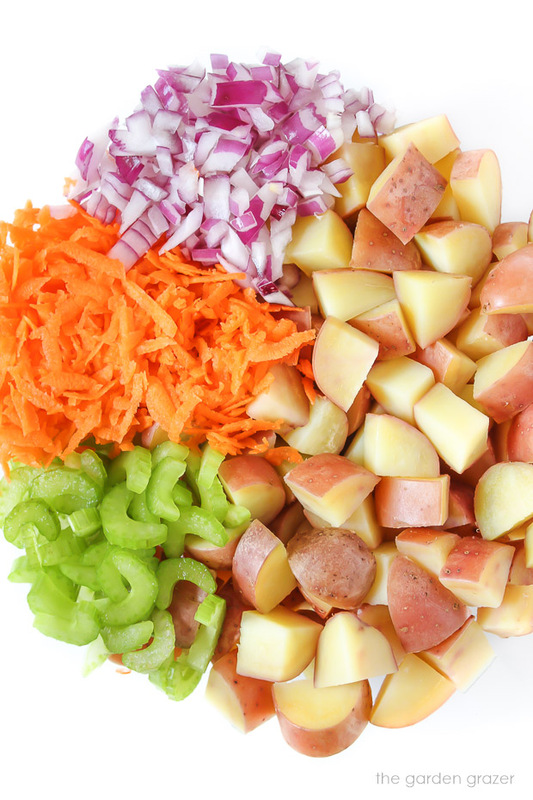 Rinse potatoes and cut into about 3/4-inch to 1-inch chunks. Place potatoes in a medium-large saucepan and fill with water to 1 inch above potato line. Add 2 tsp. salt to water. Make dressing: in a small bowl, combine mayo, both mustards, and maple syrup. (Feel free to mix in some fresh herbs if you’d like!) Stir well to combine. 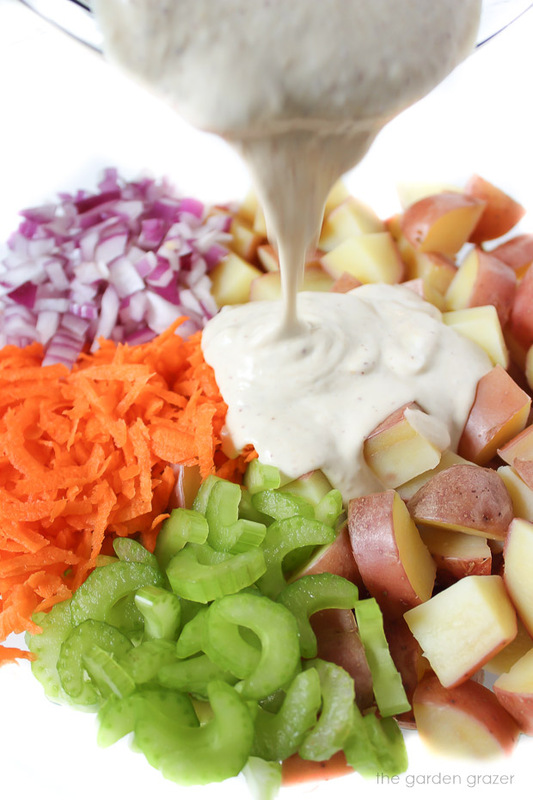 In a large mixing bowl, add drained potatoes, veggies, and pour dressing over top. Toss well to coat. Salt/pepper to taste if needed. Garnish with fresh herbs, chives, smoked paprika, etc. if desired. Initially it may look like too much dressing, but I find the potatoes soak it up quite a bit as it sits. Feel free to reduce it to your liking however! 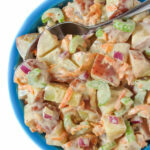 Inspired by a delicious potato salad we enjoyed at the Marquette, MI Food Co-op!